The world needs energy, and the Oil and Gas Industry plays a critical role in meeting energy demands and driving the global economy. The processes involved in producing oil and gas are highly complex and capital-intensive. Government regulations also require secondary containment enclosures capable of protecting the environment from accidental spills. 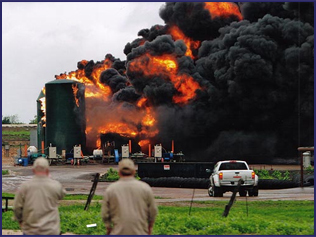 Oil and gas companies need reliable solutions that will protect the environment and critical infastructure. 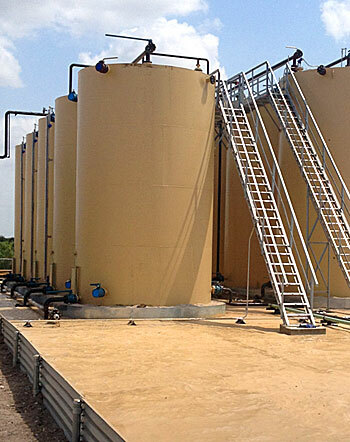 Polyurea coatings are ideal for many applications in the Oil and Gas industry. Our coatings offer a wide range of protection depending on your project's specifications, substrates, or environments. We offer time-tested solutions that add safety and protection to your company's assets. Our past and present clients range from major oil companies to smaller independents. Our commitment to on-time service and safety is why this is the fastest growing segment of our business. Modern polymer chemistry has evolved with the invention of PTU polyurea, the next generation of chemical-resistant coations. PTU is a durable, seamless, flexible coating that is resistant to many petroleum-basd chemicals, hydorcarbons, and other caustic substances. Pipes, pipelines, tanks and equipment are expensive to replace and ULC's protective coating solutions will substantially extend their service life at a fraction of the replacement costs. Interior and exterior protection of steel and concrete tanks. Above and below round pipe and tank encapsulation. Secondary containment liners for spill protection. Evaporation pit and earthen contaiment liners. Non-skid and corrosion resistant flooring, walls and roofs. PTU™ is a new generation of high-performance polyurea coating and is the result of six years of development and field testing. This chemical-resistant coating provides high-ductility, allowing it to move with expanding and contracting surfaces. PTU™ can be sprayed to any thickness in one application and returned to service in a matter of hours. Polyshield HT-100F™ is a fast-set, high-performance, spray-applied, plural-component, pure polyurea elastomer. This system is based on amine-terminated polyether resins, amine chain extenders, and prepolymers. It provides a cost-effective flexible, tough, resilient monolithic membrane with water and chemical resistance. Polyshield HT-100F™ is an excellent choice of elastomer to topcoat geo-texitle fabrics for primary or secondary containment. Polyshield HT™ is the work-horse of the pllyurea protective coating industry. Millions of square feet of this product have been successfully applied worldwide. This advnace coating combines high elongation and tensile strength properties to form a tough, flexible, resilient monolithic membrane with water and chemical resistance. Unit Liner Company has over 40 unique polyurea elastomeric coatings with a wide range of physical properties to meet your specific project requirement. ULC only produces 100% solids, pure polyurea coatings that contain no VOC's solvents, or harmful ozone depleting ingredients. Our knowledgeable team of industry experts will work closely with you from your project's beginning to the end, providing reliable coating solutions, SSPC/NACE standards and project specifications. *Contact ULC for techinal information.